God not only blessed us with creation, but called us to care for it. At TPC, we take to heart this central tenet of our covenant with God, and work to lead both churchgoers and the community at large in addressing the growing environmental concerns we face. TPC first earned this special designation from the Presbyterian Church (USA) in 2010 for our “environmental stewardship achievements in worship, education, facilitates and outreach activities.” And TPC has been re-certified every year since—an effort that requires achieving increasingly stricter results each year. support public efforts to better care for the environment that are fair and just to the vulnerable and the poor. To learn more about Earth Corps and TPC’s Creation Care ministries, please click here. TPC proudly grows an Intergenerational Garden (IGG) on the church’s yard across the side street from our building. There, both children and adults come together in the garden, not only learning how to garden, but also about the interdependence of our ecosystem, the importance of sustainable practices in agriculture, and the benefits of eating healthy foods grown locally. As we do, fellowship and community-building abound, and we grow in our understanding of what it means to be good stewards of the land. 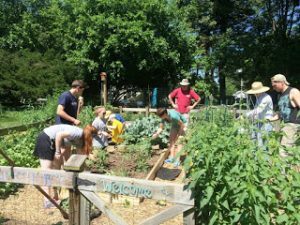 All the food grown and harvested in the garden is donated to the hungry via local food pantries. To see the latest happenings in the garden, visit the IGG blog.